A leading academic expert on Artificial Intelligence set out both its huge potential for education – and some of the looming pitfalls. Together with educationalist Sir Anthony Seldon and entrepreneur Priya Lakhani, she is one of the leaders of the new Institute for Ethical AI in Education. Headmaster Neil Enright was among those who attended its launch this month at Speaker’s House in the Palace of Westminster. During her lecture at QE, she highlighted ways in which Artificial Intelligence might obviate an impending global shortage of teachers – an estimated 69 million more will be needed by 2030. It could, for example, be used in teaching larger groups, releasing human teachers to focus on particular aspects of the curriculum with particular children. However, Professor’s Luckin’s work takes in not only how AI can be used to assist human education, but also how education itself may need to change in response to the new technology. And in her lecture to the boys and staff, she said that, since AI can learn information faster and more accurately than humans can, there is a need to move beyond a focus on subject knowledge. This, she acknowledged, was already being done at QE, with the School’s emphasis on skills such as problem-solving and on synthesising and understanding the meaning of data. There were specific issues in education which AI was particularly well-suited to tackle: speech recognition might be deployed to help people with disabilities, she said, noting that Google has predicted that developments in speech recognition will be more significant than driverless cars. Yet doing so was no easy matter, because of the ways in which voices change. In a question-and-answer session with the boys after the lecture, Professor Luckin delved into: issues of AI and consciousness; understanding what knowledge is and where it comes from; the need for AI that can explain its decisions, and how the education sector should be engaged in the development of the technology. She also explained the importance of inter-subjectivity in teaching and learning to make the best use of AI – that is, achieving the right blend between human interaction and machine-learning. 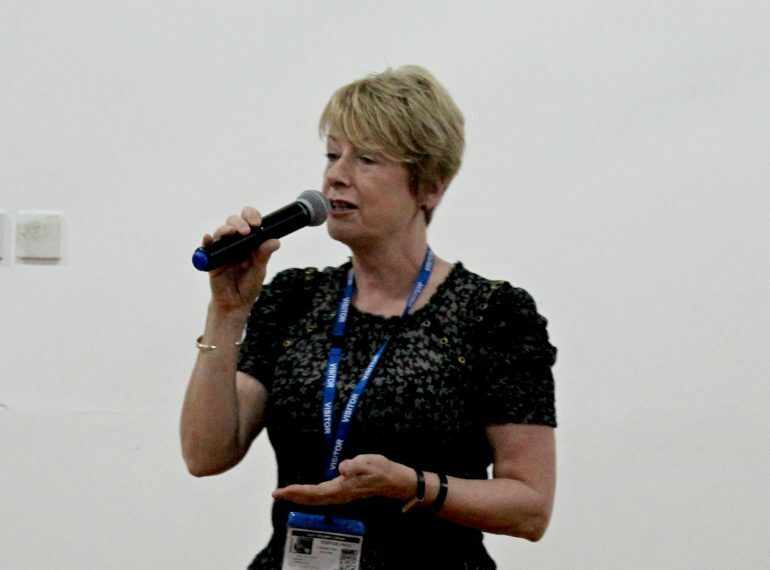 In addition to her work in education, Professor Luckin is also working with the Department of Health on a project commissioned by current Foreign Secretary, Jeremy Hunt (in his previous role as Health Secretary) into how AI will impact and can help the NHS. 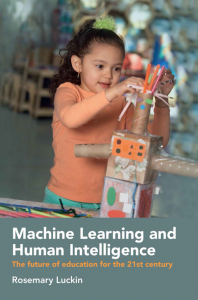 A copy of Professor Luckin’s book, Machine Learning and Human Intelligence, which was published in June, was donated to The Queen’s Library. 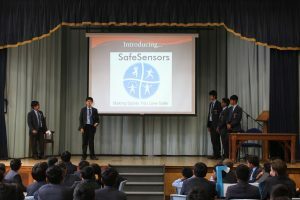 Boys in Year 8 pitted their talents against each other in a competitive Dragons’ Den-style challenge, first designing an innovative product and then pitching it at the end of the day. 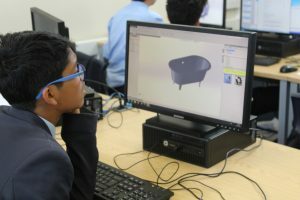 The event, held as part of the School’s Enrichment Week, aimed to get boys using skills in the STEM subjects (Science, Technology, Engineering, Mathematics). They had to design a product to solve a real-world problem, while also considering their marketing and business proposition. To create their prototypes, the participants were allocated a budget which they could use to buy the basic materials (such as card, tape and wooden sticks) from a ‘market’ in the hall. All boys in Year 8 took part in the challenge, which was split across two days. It was led by Simon Kettle, Executive Director of STEMworks, a not-for-profit company dedicated to promoting STEM. Simon also judged the boys’ projects. The winners’ product on the first day, which they named SOLAcharge, used small portable solar panels to charge a mobile phone. The second-day winners designed Simon’s particular favourite – SafeSensors, a sports helmet which not only protected the head but also had built-in impact sensors that could notify the team coach or doctor of any impact that would require a player to be treated or substituted (in cases of concussion, for example). Other ideas included mobile phones with in-built smoke alarms, smart baths (that would self-regulate temperature and could not over-fill), and even a helmet capable of styling the wearer’s hair! Four QE boys acquitted themselves very well at the finals of a national Mathematics team competition. Having first reached the Team Maths Challenge national final by winning their regional heat in March, this year’s entrants built on recent successes by QE, improving on last year’s 17th place by coming 11th out of the 88 finalists. The team, which was drawn from Years 8 and 9, achieved a score of 182 points out of 232. The UK Mathematics Trust event included a round devoted to Leonhard Euler. Born in Basel, Switzerland, Euler is considered one of the 18th century’s most pre-eminent mathematicians and is known as the ‘father of graph theory’. He notably used graphs when he presented and solved the famous Seven Bridges of Königsberg Problem, demonstrating that it was impossible to devise a journey that would cross all seven bridges in the Prussian city of Königsberg (now Kaliningrad in Russia) only once. Euler also studied topics including number theory, combinatorics (an area of Mathematics concerned primarily with counting), geometry, mathematical analysis, as well as mechanics, fluid theory and music theory. The team had won the regional heat in March, thus qualifying, for the national final of the competition at the Royal Horticultural Halls. The overall winner at the challenge was Westminster Under School. Shuttle, which is a series of mini-relays against the clock. 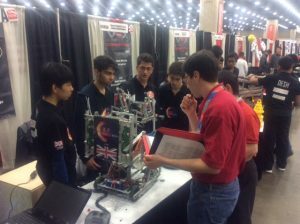 QE senior roboteers achieved the best-ever result for a UK team after qualifying for the VEX EDR Robotics World Championships at their very first attempt. The HYBRID Alpha team amassed five wins at the finals in Louisville, Kentucky, which are the culmination of a global event that has just been recognised by the Guinness Book of Records as the world’s largest robotics competition. 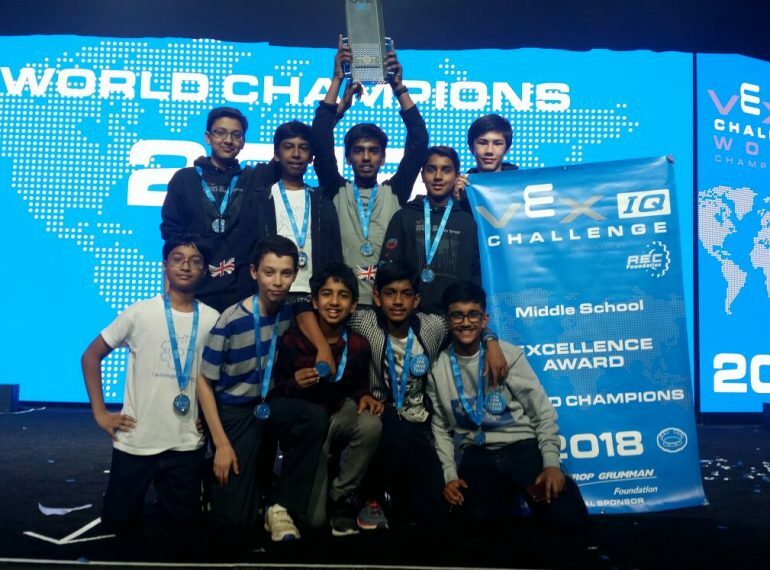 And although they were unable to match the feat of QE’s junior boys in the parallel VEX IQ competition – who were crowned the UK’s first-ever world champions – they nonetheless returned from the US with a wealth of happy memories. 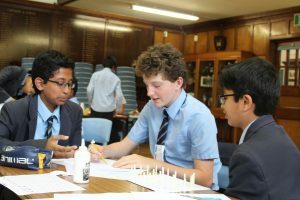 QE’s Head of Technology, Michael Noonan, who accompanied the teams together with Chemistry teacher Miss Katie Paske, added that the senior boys had “found the experience to be thoroughly enriching”. The VEX EDR World Championships, which is open to pupils from Years 10–13 (or ‘high school’, in American parlance), bring together 600 élite teams from around the world, pitting against each other national champions from 46 different countries, as well as state champions from around the US. Two senior QE teams took part, HYBRID Alpha and HYBRID Beta, both made up of boys from Years 10 and 12. 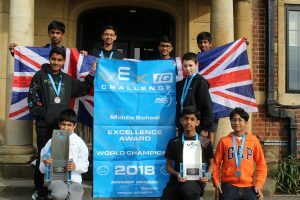 Both teams qualified for the world championships after strong performances in regional and UK national championships, with Alpha winning the Excellence award at the regional finals at Stowe School as well as being crowned Nationals Skills Champions. Beta were a last-minute qualifier, winning the Design Award at the very end of the national championships in Telford. Their trip to the US began with a 5.30am start and a long flight to Louisville, via Chicago. The following day was given over to rest and recuperation, with the boys taking in some of the local sights, such as the Muhammad Ali Centre and museum, and the Louisville Slugger factory, where the famous eponymous baseball bat is manufactured. The evening was spent in a flurry of preparation for the competition’s various challenges, or games. The following day saw another early start, the boys rising at 6.30am to get the best possible chance to practise and to discuss their tactics with other teams with whom they were put in alliances. From that point on, the daily routine was a challenging one: 12 hours’ non-stop practice and competition, all of which involved communicating with other teams from around the world. QE’s teams ended up being paired with, or competing against, teams from Bahrain, Lebanon, China, Japan, Canada and even war-torn Syria, as well as various state champions from around the US. Nevertheless, Alpha distinguished themselves with their strong performance in a divisional match, becoming the first UK team ever to reach the final 16 at the world championship – beating another London team, from Fortismere School in Muswell Hill, to this honour by a matter of a few moments. Alpha’s disappointment at the loss was later rendered bittersweet when one of these two opposing teams went on to remain undefeated in all their remaining games and eventually be crowned World Teamwork Champions. There were two more treats in store for the boys: they were able to see the unveiling of the newest robotics game, Turning Point, and they had just enough time to enjoy the thrilling rides and attractions of the Kentucky Kingdom theme park before heading for home. 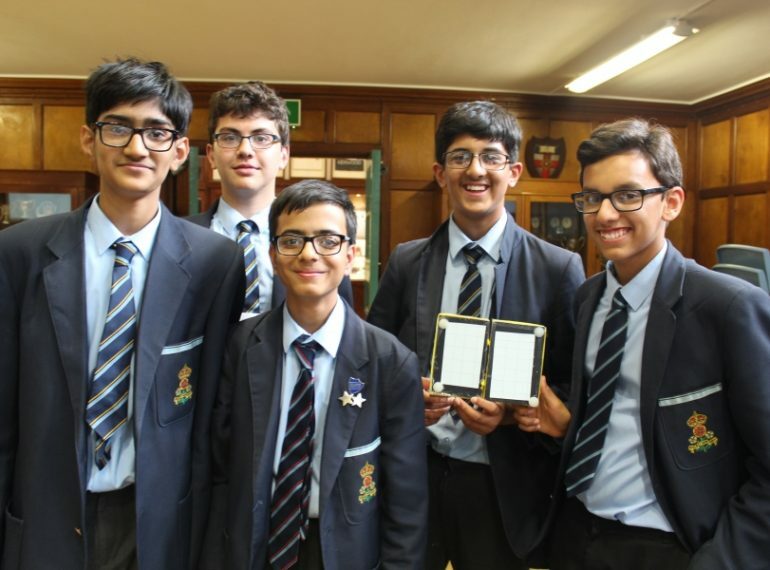 The Alpha team comprised: Year 12 pupil Aadi Desai, with Deshraam Ganeshamoorthy, Bhargab Ghoshal, James Tan and Ukendar Vadivel, all from Year 10. Beta were: Dilan Sheth, of Year 12, together with Year 10 boys Sunay Challa, Devin Karia, Daniel Radzik-Rahman and Yai Sagolsem. Year 11 boy Saruthan Seelan achieved a top-50 finish among élite mathematicians in his age group in this year’s nationwide Intermediate Olympiad, with four other pupils coming in the top 100. Like Saruthan, Year 10 pupil James Tan and Year 9 boys Athiyan Chandramohan, Abhinav Santhiramohan and Dan Suciu all won medals for their performance, while Andy Kwak, of Year 9, was awarded a distinction certificate for coming in the top 25% nationally. 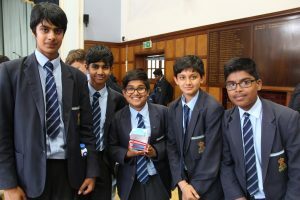 The six were among 27 boys from Years 9 to 11 who qualified for the Olympiad after performing strongly in the UK Mathematics Trust’s Intermediate Challenge. An additional 21 were awarded merit certificates. 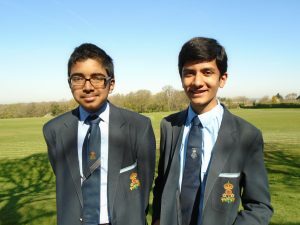 Saruthan said afterwards: “The Olympiad questions help me to extend my understanding of Maths.” James found solving the problems “very satisfying”, while Abhinav praised the “interesting maths” involved. Nearly 1,700 students took part in the Olympiad. In each year group, the top 50 receive book prizes, the top 100 receive a medal and the top 25% receive a certificate of distinction. In the Intermediate Challenge’s other follow-on round, the European Kangaroo, 135 QE boys from Years 9 to 11 took part, of whom 41 were awarded merit certificates. The Kangaroo’s high scorers in each year group were: Jamie Watkin-Rees (Year 11 – the second consecutive year that he has come top of his year group in this competition); Tanishq Mehta (Year 10), and Beuran Kannan (Year 9). Tanishq said he particularly enjoyed the “logical aspect of the questions”. This is the 16th year that the UKMT has run the International Mathematical Olympiad and Kangaroo contests. The latter is promoted by Kangourou sans Frontières, an independent association promoting Mathematics among young people around the world: its name reflects the fact that the organisation was inspired by the Australian Mathematics Trust. 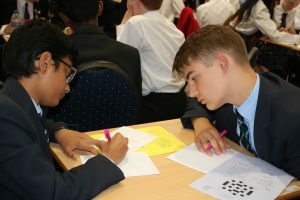 Three million students worldwide take part in the Kangaroo, usually including around 5,500 pupils invited to take part after sitting the UK Intermediate Challenge. 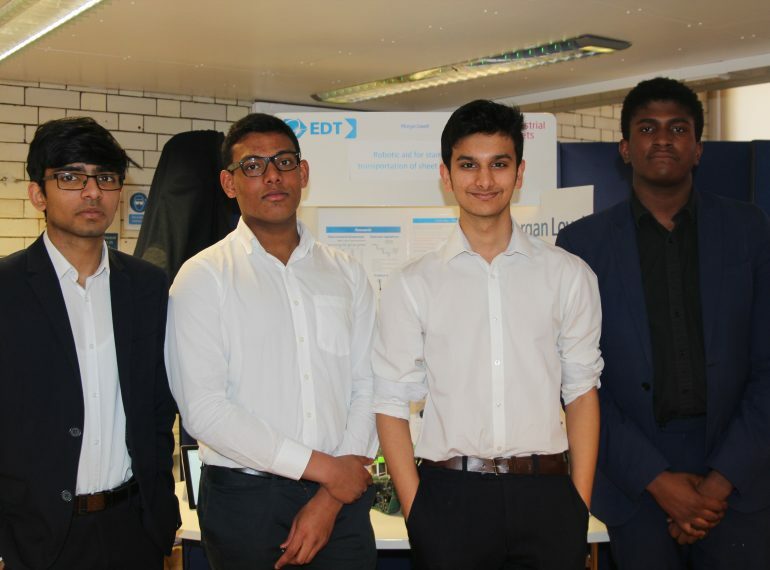 A QE Sixth Form team has been praised by independent judges after designing a robotic machine to tackle one of the major causes of long-term injury in the construction industry. 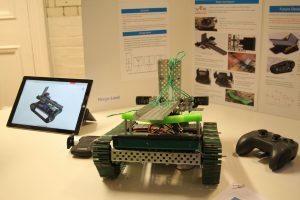 The four AS-level Technology students’ ingenious solution to the problem of transporting large sheets of material up staircases on construction sites was a robot with rubber caterpillar tracks. The project was Highly Commended in the Contribution to the Business Award at the Celebration and Assessment Day of the Engineering Excellence Scheme (EES). 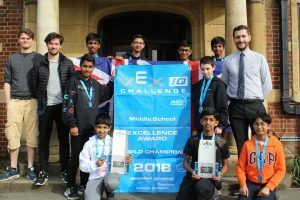 Their success follows the recent triumph of a team of younger QE boys who won a world title at the Vex IQ Challenge international robotics finals in the US. Congratulating the sixth-formers, QE Technology teacher Tony Green said: “The EES assessors were really impressed with our boys’ ideas, praising their ‘great analysis of the existing Health & Safety issues and how they were solved by the solution’, as well as their ‘excellent application of a suitable mechanism’.” The judges lauded the team for differentiating their solution from existing robotic aids that are already available to move materials up staircases. The EES, said Mr Green, is not a competition – the projects involved are too diverse for that – but the Contribution to the Business Award does allow the assessors to celebrate particularly strong project ideas. The scheme pairs teams of senior pupils up with industry mentors. It aims to give them opportunities to experience the challenge of a career in Science, Technology, Engineering and Maths (STEM) and the fulfilment that such careers can bring. 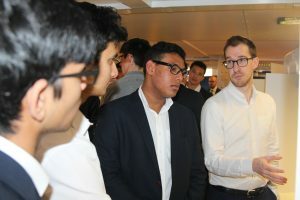 QE teamed up with construction company Morgan Lovell: Alex Woods, the firm’s Health and Safety Manager, and Delores Salgado, a Health and Safety Executive, served as mentors and provided the QE boys with a real-world engineering problem for them to resolve during the six-month project. Nathan Aderogba, Pranavan Gunaseelan, Chaitra Kawathekar and Kayman Krishnamohan were tasked with designing and testing a prototype that could autonomously or semi-autonomously lift large materials up flights of stairs. As part of their detailed research, the boys went on site visits to familiarise themselves with construction sites and see at first-hand the issues involved in lifting materials such as sheets of plasterboard, doors and windows up staircases. The team looked at existing industrial equipment used for transporting large items both on level floors and on stairs. They studied staircase building regulations and standard sheet material dimensions and investigated various types of wheels, as well as different configurations for caterpillar tracks. Based on the results of this research, the boys held a brainstorming process in which several ideas were examined and then rejected, before they eventually chose and developed a design which involved sheets being clamped on to a carrying tray located on a turntable. This allowed sheets to be carried vertically, for narrower spaces, but also horizontally, giving greater stability. It used rubber caterpillar tracks, which not only provide good grip but also avoid damage to floors. 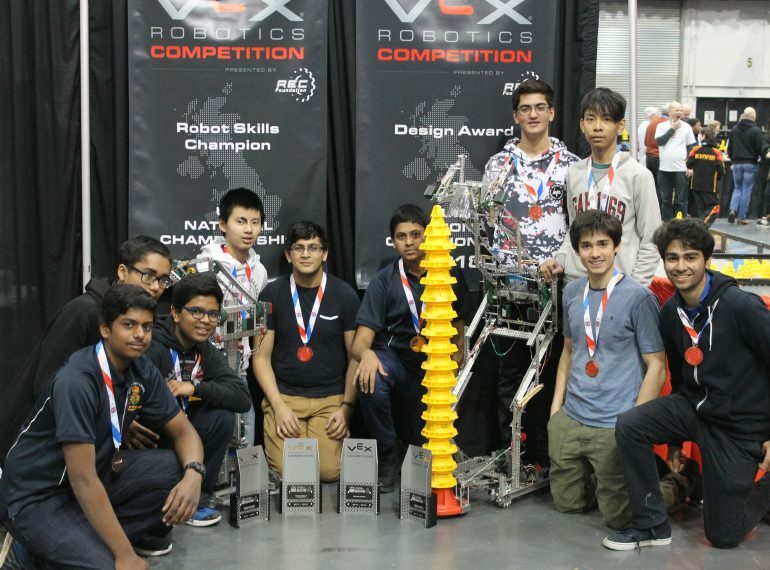 The boys used kit robotics components from VEX Robotics. None had had previous experience of either programming or robotics. Respond to 10–15 minutes of detailed questioning by the assessing panel. As a result of their successful participation in the scheme and the assessment day, the four boys were recognised as having graduated as Industrial Cadets at gold level. 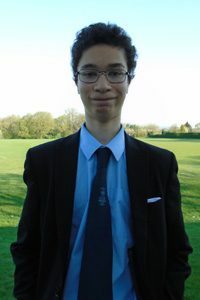 Queen Elizabeth’s School has once again excelled in the British Biology Olympiad, with two sixth-formers reaching the final round, which is open only to the top 16 young biologists in the country. 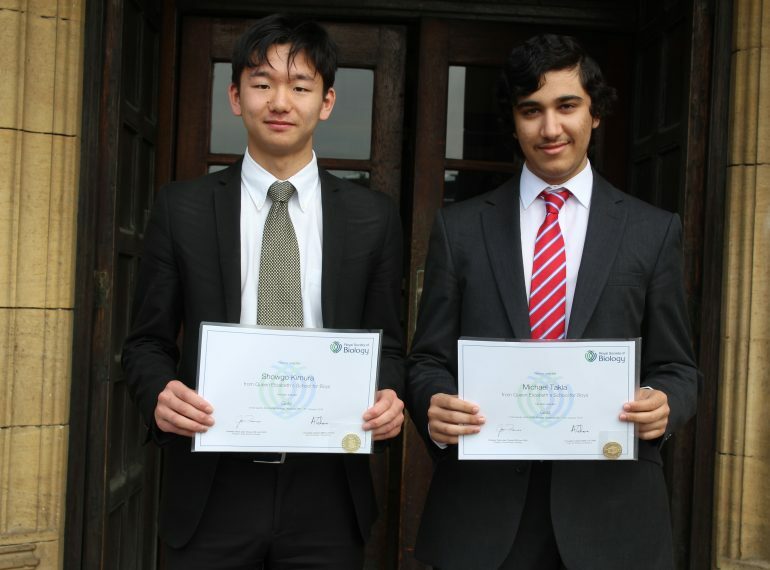 Year 13 pupils Showgo Kimura and Michael Takla were selected from Round 2 for the four-day finals, a series of practical examinations held at Warwick University. 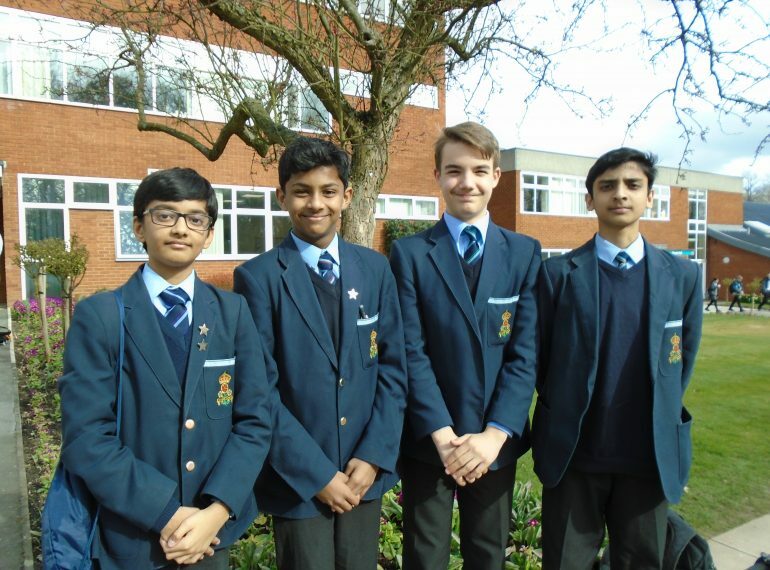 They were among five QE boys who had qualified for Round 2, with the others being fellow sixth-formers Ilan Elango, Milan Hirji and Simon Rey. The five’s qualification placed them in the top 2 per cent of the 7,818 entrants nationwide. Last year, QE was crowned the best-performing school in the country in the prestigious Olympiad competition, and although it will not be known until later this year if it has repeated this feat, the School is certainly in a strong position, says Biology teacher Mev Armon: it has amassed a total of 14 gold, 16 silver and 15 bronze medals. After returning from Warwick, the pair reflected on the experience. Their preparation included areas such as botany, gel electrophoresis and locust dissections. Showgo added: “Unlike with School practicals, we weren’t given any extra reagent, even if we had used ours up, and this meant it was important to plan before starting. I realised this too late and had almost finished the blood sample provided on making blood smears when I needed more to complete the rest of the examination. QE is the first UK school ever to win a world title in the Vex IQ Challenge international robotics finals. The QE pupils emerged to take the Excellence Award at the finals in Louisville, Kentucky, which holds a Guinness World Record as the world’s largest robotics competition. The Excellence award is the highest presented in the VEX IQ programme, going to the team that exemplifies overall excellence in building a high-quality robotics programme. 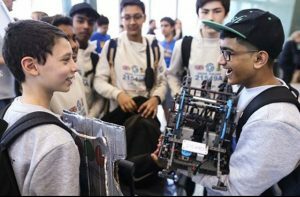 They saw off no fewer than 400 teams from 40 countries – including leading schools from the US and China which have usually provided the winners throughout the competition’s 11-year history. It was only the second year that boys at QE had participated in VEX Robotics, having become UK national champions during their first season in 2017. The QE boys were judged on their robot design, programming skills, driving skills and STEM (Science, Technology, Engineering & Mathematics) research project, with all of the judges in their division agreeing they were the overall ‘best of the best’. QE’s Head of Technology, Michael Noonan, said: “This is a truly phenomenal achievement and far surpasses all our expectations. It is a hugely competitive event, which attracts some of the most intelligent young minds in the world. The Year 9 Gear Squad team were especially commended and, together with our Year 8 Technogear team, demonstrated a voracious hunger for success whilst retaining their humility. “Gear Squad and Technogear greatly impressed the judges with their confident and student-led presentations and explanations. 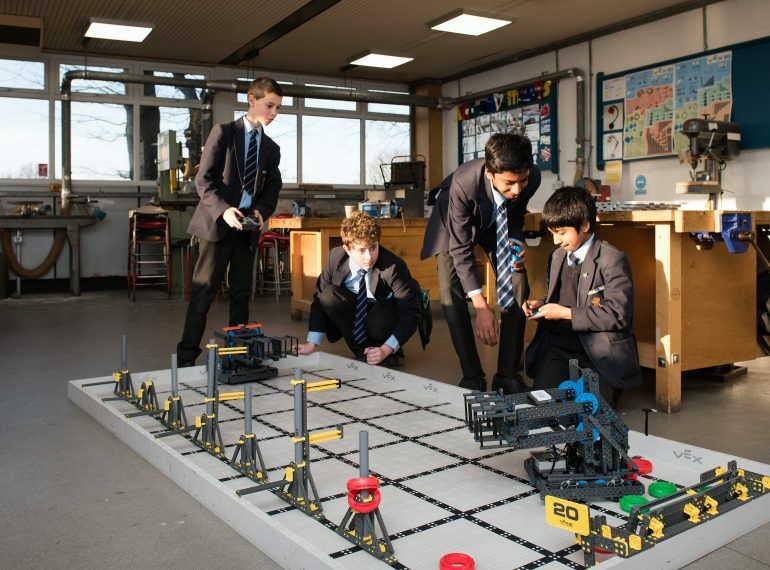 In fact, the most notable aspect of the VEX IQ programme at Queen Elizabeth’s is that it is entirely student-led. It is estimated that there are 8,500 VEX IQ teams around the world. The VEX IQ challenge is aimed at pupils from Years 5-9. 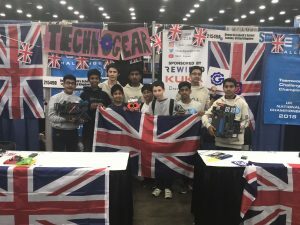 Despite nationwide challenges in getting young people to pursue STEM careers, QE and other teams taking part from the UK showed that British pupils can not only compete but be leaders in this field, supported in their preparations by both curricular and extra-curricular programmes, said the organisers. In fact, QE is ranked in the top ten UK schools for take-up and performance in the STEM subjects, and no fewer than 22 of last year’s leavers went on to read Engineering at university. The 400 teams taking part were split into five divisions of 80. 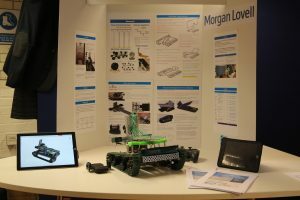 The VEX IQ competition is multi-faceted: in addition to the overall Excellence Award, within each division there were prizes for categories such as the STEM research project, design booklet competition, teamwork challenge and robot skills competition. Mr Noonan added that the criteria for winning the Excellence Award included being “a shining example of dedication, devotion, hard work and teamwork”. The award took into account the performance and subsequent rankings of the winners in all competitions within the overall event, but was ultimately decided by interviews from the chief judges. He added that it was clear that both QE teams benefited from being pupil-led “as they demonstrated an outstanding amount of independence at the world stage in solving problems and performing to their optimum”. Gear Squad consists of Year 9 boys Vihaan Jain, Varun Vijay Kumar, Shilacshan Lingakumar, Dillan Shah and Alex Woodcock. Technogear comprises five Year 8 boys: Arjun Arunkumar, Dylan Domb, Aditya Khanna, Anish Rana and Yash Shah. The boys were accompanied to the US by Mr Shane Ryan (Technology) and Mr Jonathan Leigh (Physics). QE pupils beat off competition from 30 other schools to win the regional round of the Team Maths Challenge. The four boys from Years 8 and 9 secured victory over Merchant Taylors’, in second place, and Haberdashers’ Aske’s Boys’, who came third. 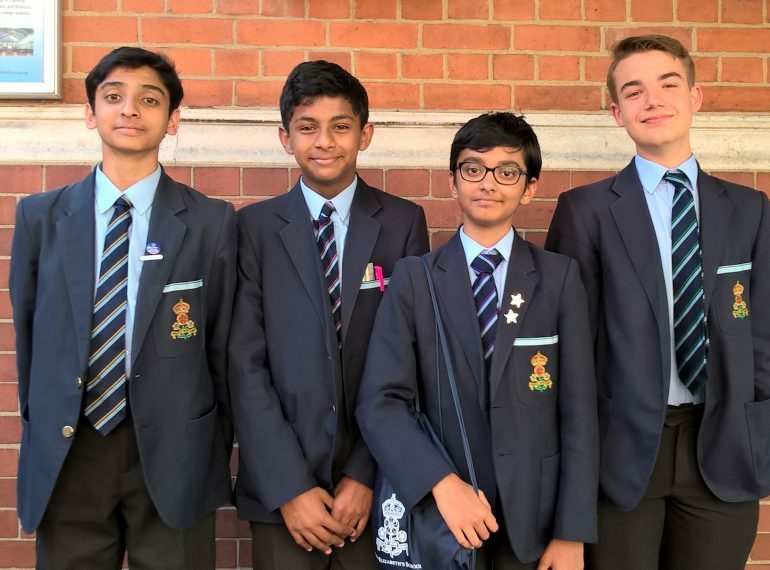 They now go through to the national finals in London’s Royal Horticultural Halls in June – the third time that a QE team has reached this stage in the prestigious UK Mathematics Trust contest. 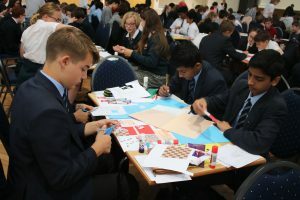 The team was led by Year 9 pupil Dan Suciu and comprised Shimaq-Ahamed Sakeel Mohamed, also of Year 9, together with Year 8 boys Bhunit Santhiramoulesan and Agrim Sharma. They scored a winning total of 223 points out of 236 in the event, which was hosted by Haberdashers’ Aske’s School for Girls in Elstree. Group round – working as a team of four to solve ten problems. Four QE teams are gearing up for the challenge of the world finals of a robotics competition at the end of April, following their successful qualification. 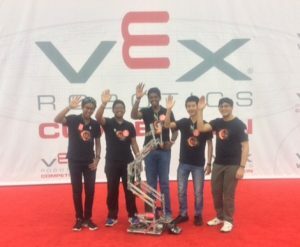 Two senior teams, Hybrid Alpha and Beta, won places in the VEX EDR Robotics World Championships in the USA at the School’s very first attempt. And at the VEX IQ junior level, a further two teams, Gear Squad and Technogear, are also heading for the finals in Louisville, Kentucky, having matched the feat of the double qualification by QE teams in 2017, the first year the School had entered the junior competition. The boys’ efforts have been boosted by the support of the Foundation Trustees and of one particular OE, Sachin Dev Duggal (1994–2001), who is an AI entrepreneur. Hybrid Alpha qualified after taking the Excellence Award in the regional EDR event at Stowe School during the winter. Then, at the national finals held at Telford International Centre, the other senior team, Beta, picked up the highly sought-after Design Award for the design process itself and their excellent logging and tracking of it, which secured them a berth at the World Championship. Gear Squad qualified at the IQ national finals, also at Telford, by retaining the Teamwork Champions title won by QE last year, whilst Technogear won the Design Award in the junior category. “In the biggest national finals yet, the boys held their nerve and performed valiantly,” Mr Noonan said. 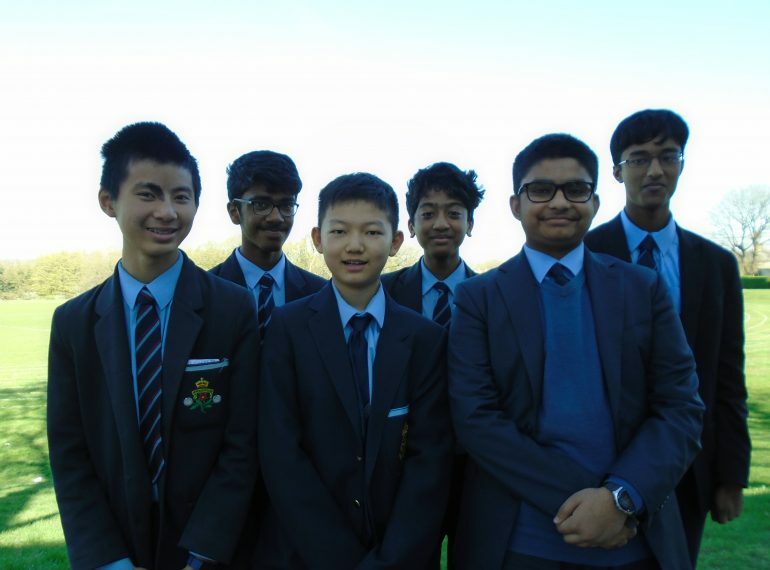 The Alpha team is made up of: Year 12’s Aadi Desai, together with Deshraam Ganeshamoorthy, Bhargab Ghoshal, James Tan and Ukendar Vadivel, all of Year 10. The Beta team comprises: Dilan Sheth, of Year 12, along with Daniel Radzik-Rahman, Yai Sagolsem, Devin Karia and Sunay Challa, from Year 10. Gear Squad consists of Year 9 boys Vihaan Jain, Varun Vijay Kumar, Shilacshan Lingakumar, Dillan Shah and Alex Woodcock. Technogear comprises five Year 8 boys: Arjun Arunkumar, Dylan Domb, Aditya Khanna, Anish Rana and Yash Shah.